I have been a member of the clean palette club far too long. Everyday life sometimes gets in the way of creativity. Many artists have struggled with this problem and it can be caused by many different issues. Sometimes it is artist's block. Sometimes it is just finding the time. I have had a hectic schedule this past year. House renovation projects have consumed a great deal of my free time. The cooler weather will soon be upon us or supposedly on its way, it was 61 degrees today in upstate New York! This will help slow down the outdoor fix it projects and will hopefully allow more time for me to paint watercolor paintings instead of walls, siding and fences. 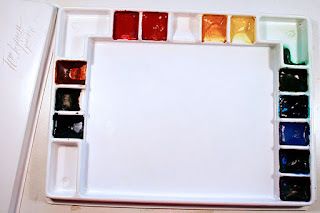 Okay, I do love to have a clean palette every time I start to paint. I try to clean my palette when I am done painting for the day. But now it needs to get dirty! I have placed my clean palette on my studio table. It's ready to go! My ACEO Art Cards are miniature original watercolor paintings. I have some available for sale in my Squier Etsy Shop and also on my own website. Reclaimed Wood Tea Light Candle Holders made from reclaimed wood were once upon a time a country fence. Now they can light up your life! 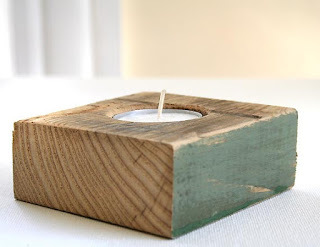 This rustic candle holder and more are on sale in our Squier Etsy Shop! Fits in a variety of decors: urban rustic, country cottage, shabby chic, woodsy cabin decor and more. Makes a great wedding table decor! 2015's Printed Christmas Cards are hot off the presses! 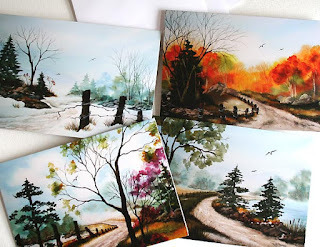 My watercolor Country Road series is available as note cards. The inside is blank for you to write your own message. You can get all four seasons or a bunch of just one season. 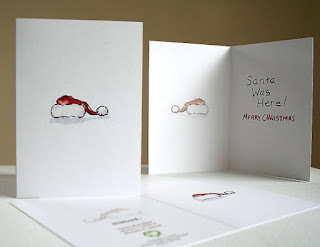 Or drop me a note for a custom order for these gorgeous cards. Country Road Winter would make a beautiful Christmas Card! 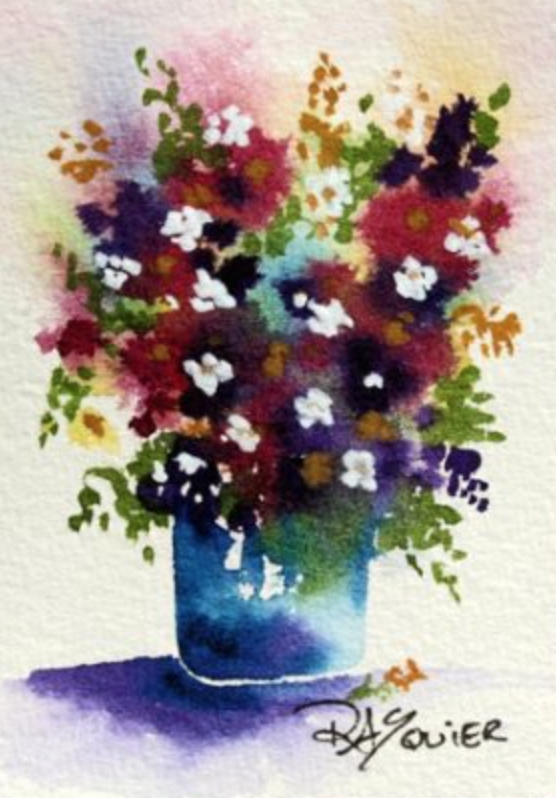 This "art card" is an original watercolor painting. 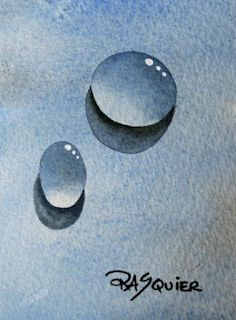 It is one of my favorites from my Dew Drop Series! The color, the three dimensionality. Did you know today is May Day? May Day is the day your are supposed to surprise someone special with flowers. Gather up some flowers into a pretty little bouquet. Leave them on the front door step, ring the doorbell and run away! I'm hoping my sweetheart will leave flowers for me today. I think it's time to wake up this sleepy blog and bring it back to life! Are you up for more ramblings, posts, etc. 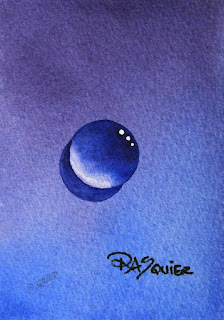 on watercolor painting tips & tricks and other silly things that may come to mind? 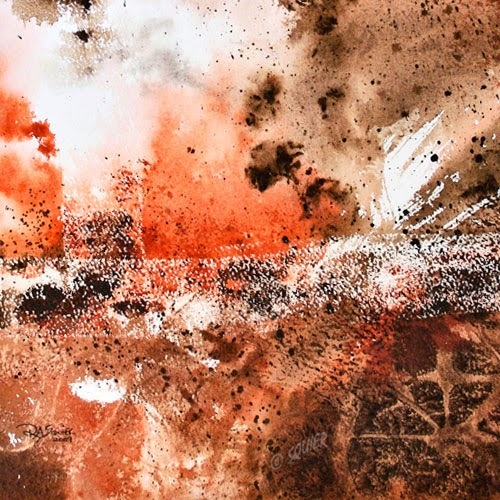 This painting was from an abstract painting class I taught a few years back. It's filled with a number of watercolor tricks. It gives me a few ideas I can share in upcoming posts.